“At this point in my life…” What a daunting statement begging for disappointment from the onset. How angry we get when we have not reached the expectation of our own foreshadowing. What an arbitrary gauge we use as a guide. I read a study once that showed people on average rated their peers as being ten years younger than themselves. Meaning, a fifty-year-old man thought he was in the same peer group as a forty-year-old when looking at pictures. To be honest, I find that quite enchanting and oddly comforting in its innocence. The problem though is we think we have sixty years remaining and then fifty, and before we know it it’s only ten. Ten years and that’s if the great humor of the world hasn’t pulled the rug out from under us before we even knew we were standing on it. We are born on average with 27,000 days. Most reading this have gone through 10,000 of them already. Musician Peter Gabriel is nothing if not meticulous. He is also, because obviously I know him personally, unpredictable. It’s what makes listening to his music so interesting. In sound form, he manifests this intense unknown force. It took Gabriel almost ten years between the release of Us and Up to capture it on record. During that time he gave hints, released odd updates around each full moon, and recorded more tribal drums than any British man should attempt. He informed us of his progress. Progress has always been a finicky thing for Gabriel. He was once nailed shut in a studio room to keep him from distractions. Those following Gabriel waited and waited for years to have songs engulf their ears with sound. And unless you make them wait almost forty years, like with Brian Wilson’s Smile, people become antsy, suspicious, and harder to please as the anticipation builds. You start to live by the proof of your genius as the fans stand through your burden of progress on display. Will it be worth the wait? Will it deliver? Does failure seem more imminent than success? If you’re wondering how it turned out for Gabriel’s Up, it was, at least initially, a critical disappointment. But throughout the years, it became more and more appreciated on a higher level—whatever the hell that actually means. People rarely realize they drill themselves harder than those around them. The truth is progress is often like a messy stock chart. It can have beautiful rises and devastating crashes. You can’t always depend on the quick glance; you have to step back and see it over time as a whole. Even the most aggressive of dives can stay down for years only to rise again. It’s easy to see we aren’t learning when we’re there. It’s easy to see we are failing when we’re there. It’s easy to see up is down and stable is crumbling. It’s easy to forget the lessons to be learned when we are on the floor or devastated by disappointment. Like a kid stumbling, you forget that you learn when you touch the hot stove, not to do it again. Though the lessons in adulthood can become more muddied—we learn. We learn even when stuffing our fingers in our ears and covering our eyes shouting “la la la” to the lessons we don’t want to see—we learn. Stagnation doesn’t exist. We are always progressing towards something, even if it seems like failure—even if it is failure. Not to be prosaic but the very concept of the Phoenix exists because it’s fallen. Everywhere is a starting point. Stop collecting your missteps as if you’re preparing for a meeting with the parole board ready to send you back to prison. At every opportunity, even the ones where you lay wallowing on the ground searching for steady legs, remember something you’ve learned. Remember something to hope for. Remember a strong moment you had because it’s in there somewhere. Use your past progressions to push your current journey forward. Step back and look at the big picture of what has been, what is, and most importantly, what can be. Life is a line. 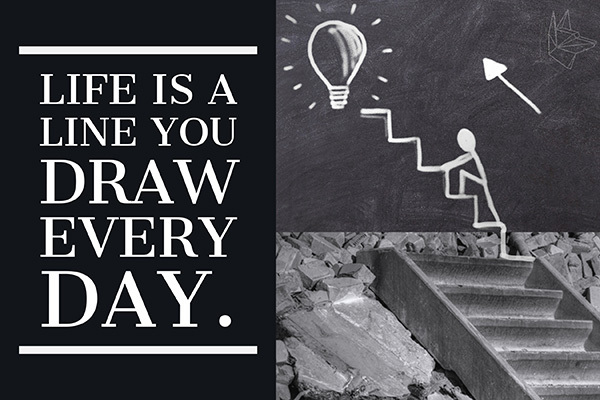 You draw the direction every day. Maybe today you draw it up. Maybe tomorrow you do it again. Maybe the next time you draw it down but then remember you can grab your purple crayon like Harold and draw the line back up to the next great part of your life.